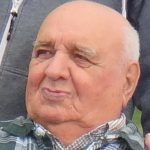 Walter Luckham of Logan Lake BC passed away in Kamloops BC on June 14, 2017 after a lengthy illness. He was 82 years of age. Born on August 7, 1934 in Vancouver BC, Walter is survived by his wife of 58 years, Joan; three sons, Allan, Mark and Terry; five grandchildren and two great grandchildren. Spending time with them made Walter proud and happy. Walter was a hard worker and after work he enjoyed his retirement. He loved fishing, hunting with family and friends. Please join us to Celebrate Walter’s Life at our open house, 273 Alder, Logan Lake BC, on July 1, 2017 from 1:00 p.m. to 4:00 p.m. So very sorry for your loss. My thoughts and prayers are with you and yours at this sad time.